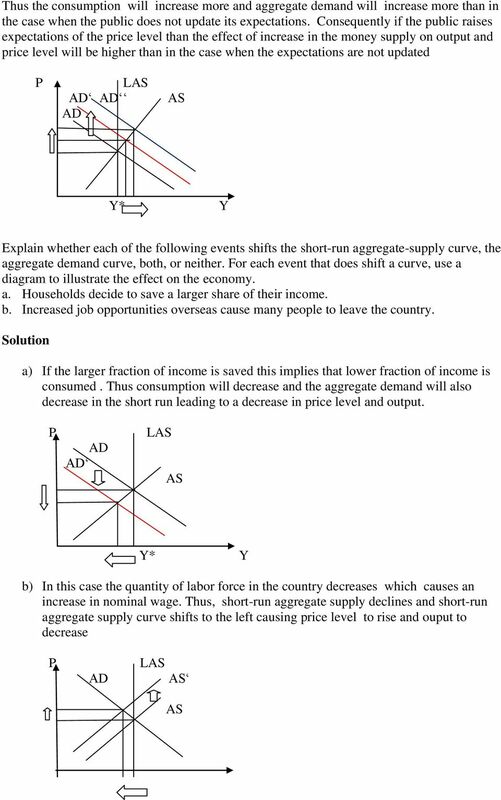 Download "AGGREGATE DEMAND AND AGGREGATE SUPPLY The Influence of Monetary and Fiscal Policy on Aggregate Demand"
2 short-run aggregate-supply curve, how does the real wage at points B and C compare to the real wage at point A? Figure 31-8 At point B the economy is in a recession thus the unemployment level is higher than at point A, where the potential GDP or natural GDP is produced at the unemployment is at its natural level. At point C the unemployment is at its natural level the same as in point A. If the nominal wage is sticky, the real wage at point B and C is higher than in point A since the price level compared with point A is lower. Suppose the Fed expands the money supply, but because the public expects this Fed action, it simultaneously raises its expectation of the price level. What will happen to output and the price level in the short run? Compare this result to the outcome if the Fed expanded the money supply but the public didn t change its expectation of the price level. Expansion of money supply will lead to a decrease in the interest thus stimulating aggregate demand. 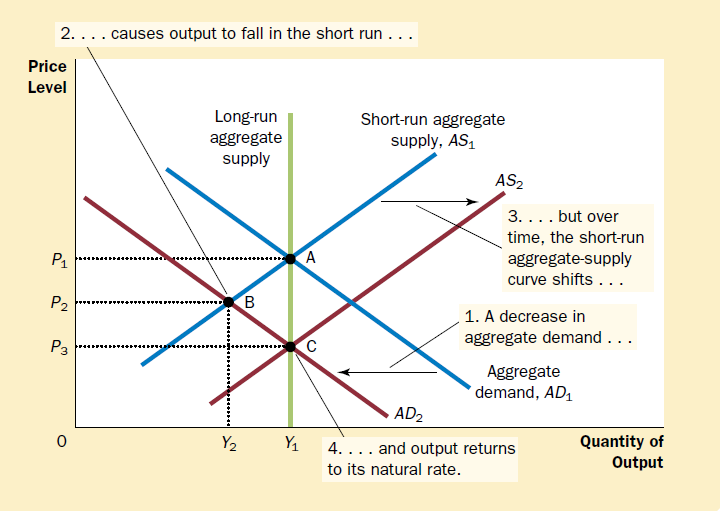 Increase in aggregate demand will lead to an increase both in a price as well as output in the short run. However, if, in addition public raises its expectations of the price level, it will want to increase the purchase of goods immediately to get rid of money. 4 For each of the following events, explain the short-run and long-run effects on output and the price level, assuming policymakers take no action. a. The stock market declines sharply, reducing consumers wealth. b. The federal government increases spending on national defense. c. A technological improvement raises productivity. d. A recession overseas causes foreigners to buy fewer U.S. goods. a) Reduction in consumer wealth is going to decrease consumption and to decrease aggregate demand thus leading to a decrease in price level and output in the short-run. In the long-run however the output is going to return the narutal GDP level but the pric level will be the lower than under the initial long-run equilibrium b) Increase in government purchases is going to increase the aggregate demand thus leading to an increase in price level and output in the short-run. In the long-run however the output is going to return the narutal GDP level but the pric level will be higher than under the initial long-run equilibrium c) Improvement in technology implies an increase in both short run as well as long-run aggregate supply thus leading to a lower price level and higher output both in the short run as well as in the long run. P L L * Y d) In this case export decreases which leads to a decrease in net export and a decrease in aggregate demand thus leading to a decrease in price level and output in the short-run. In the long-run however the output is going to return the narutal GDP level but the pric level will be the lower than under the initial long-run equilibrium Explain how each of the following developments would affect the supply of money, the demand for money, and the interest. Illust your answers with diagrams. a. The Fed s bond traders buy bonds in open-market operations. b. An increase in credit card availability reduces the cash people hold. c. The Federal Reserve reduces banks reserve requirements. d. Households decide to hold more money to use for holiday shopping. e. A wave of optimism boosts business investment and expands aggregate demand. f. An increase in oil prices shifts the short-run aggregate-supply curve to the left. 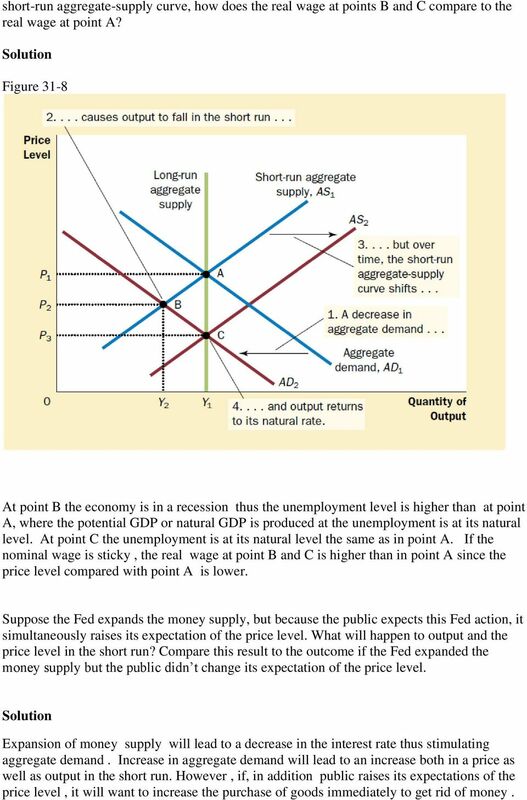 6 P L f) Shift of the aggregate supply to the left decreases the level of income in the economy and leads to a decrease in the demand for money. Thus interest decreases. Suppose banks install automatic teller machines on every block and, by making cash readily available, reduce the amount of money people want to hold. a. Assume the Fed does not change the money supply. 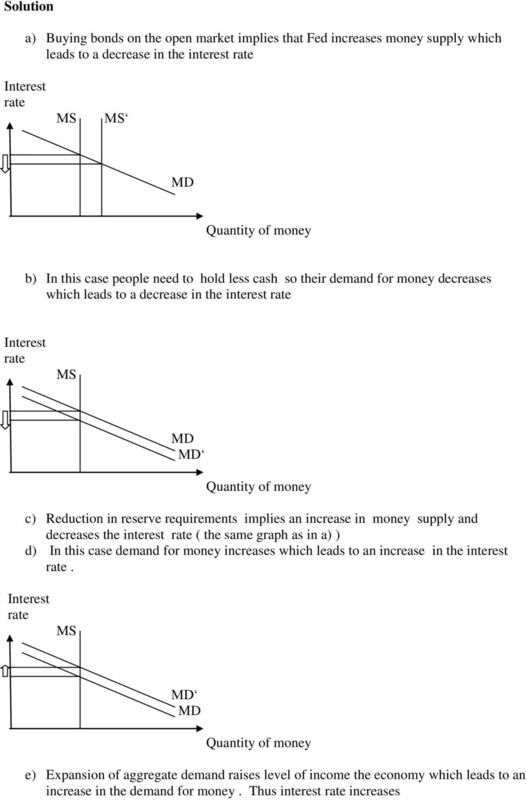 According to the theory of liquidity preference, what happens to the interest? 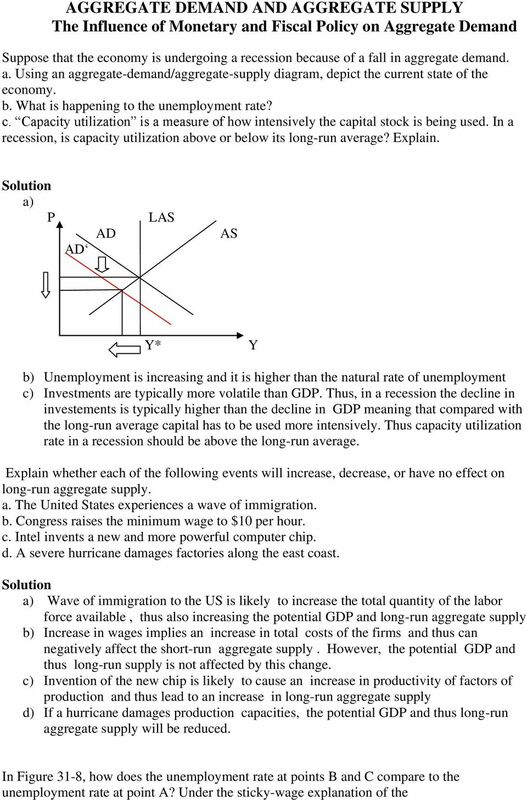 What happens to aggregate demand? b. 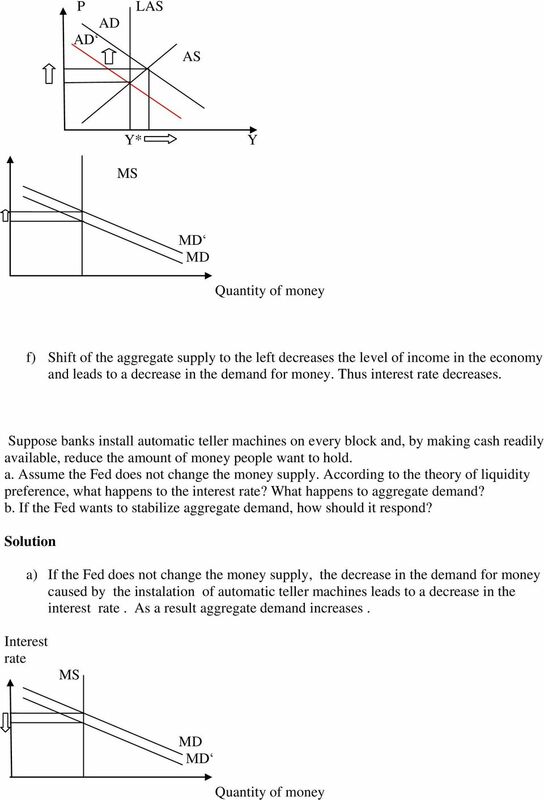 If the Fed wants to stabilize aggregate demand, how should it respond? a) If the Fed does not change the money supply, the decrease in the demand for money caused by the instalation of automatic teller machines leads to a decrease in the interest. As a result aggregate demand increases. 8 MPC=0.66 b) If we take into account crowding out effect, which somewhat reduces positive effect of increase in government expenditures on aggregate demand, than we can conclude that MPC should be higher to get the observed change in aggregate demand. Suppose the government reduces taxes by $20 billion, that there is no crowding out, and that the marginal propensity to consume is 3/4. a. 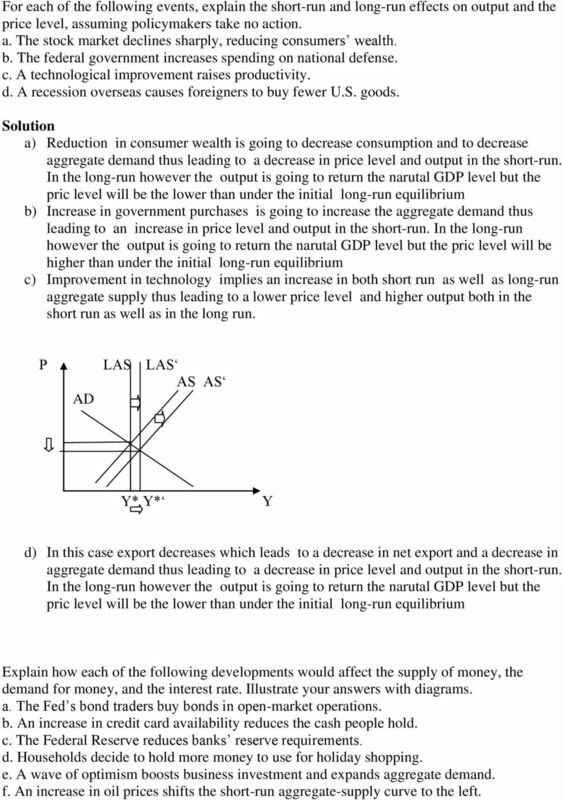 What is the initial effect of the tax reduction on aggregate demand? b. What additional effects follow this initial effect? 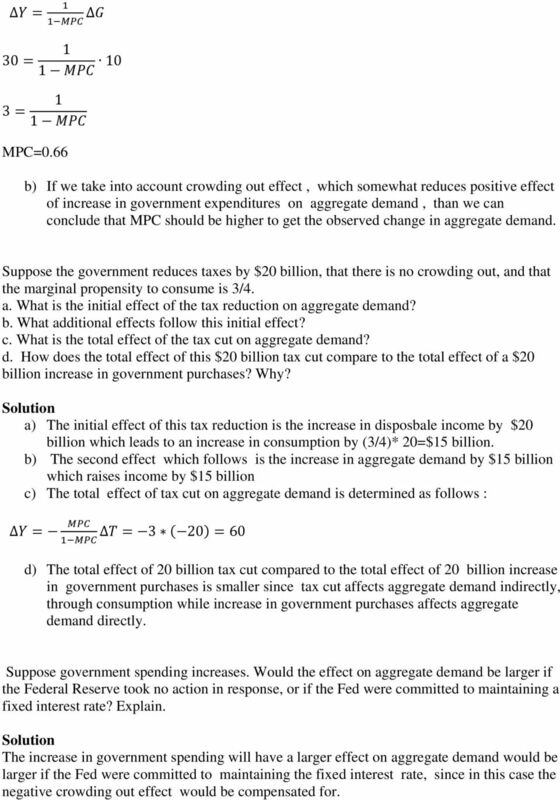 c. What is the total effect of the tax cut on aggregate demand? d. How does the total effect of this $20 billion tax cut compare to the total effect of a $20 billion increase in government purchases? Why? a) The initial effect of this tax reduction is the increase in disposbale income by $20 billion which leads to an increase in consumption by (3/4)* 20=$15 billion. b) The second effect which follows is the increase in aggregate demand by $15 billion which raises income by $15 billion c) The total effect of tax cut on aggregate demand is determined as follows : d) The total effect of 20 billion tax cut compared to the total effect of 20 billion increase in government purchases is smaller since tax cut affects aggregate demand indirectly, through consumption while increase in government purchases affects aggregate demand directly. Suppose government spending increases. 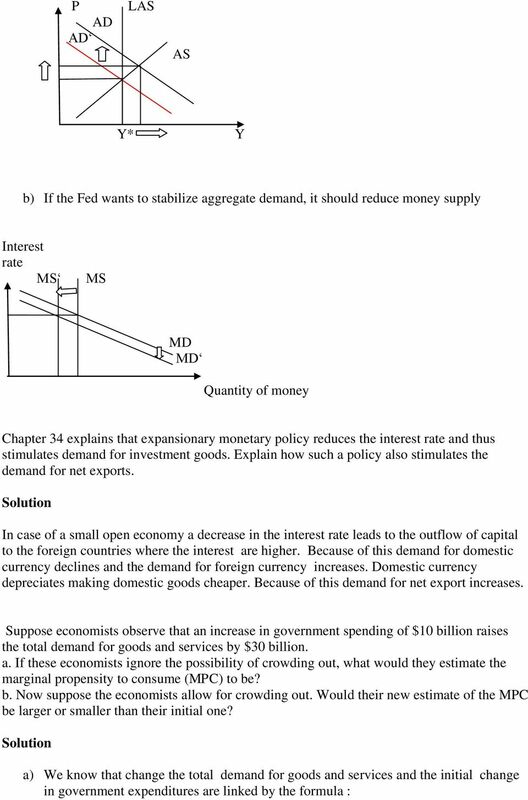 Would the effect on aggregate demand be larger if the Federal Reserve took no action in response, or if the Fed were committed to maintaining a fixed interest? Explain. The increase in government spending will have a larger effect on aggregate demand would be larger if the Fed were committed to maintaining the fixed interest, since in this case the negative crowding out effect would be compensated for. 1. If the MPS = 0.1, then the value of the multiplier equals: a. 5. b. 10. c. 9. d. 1. Is the Australian economy heading for a severe recession? If so, what (if anything) can policy makers do about it?